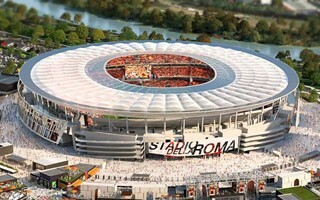 Long-awaited report confirms there will be mobility challenges for Rome but the stadium is beneficial. That's why today Rome mayor Virginia Raggi assured construction will start within a year. “Stadio della Roma is done and the proponents can enter construction site within a year.” said Virginia Raggi today, making Rome's quote of the day and prompting the hashtag #loStadioSiFa in social media. This most recent act of support for AS Roma's new stadium in Tor di Valle is direct outcome of a mobility report by Politechnica di Torino, commissioned by the city. “I requested this additional opinion, I wasn't obliged to have it. The prosecutor's office confirmed there were no issues with the project but I wanted to make sure this is true not just formally, but in reality. This independent opinion confirms it, it's another go-ahead. It will be published today in full.” Raggi continued. She also argued that she isn't obstructing the development, just ensuring that it would benefit the people, not just the investor. And it will, according to numbers quoted by her up to half a million people will feel the benefits of Tor di Valle's €1 billion complex. The polytechnics report confirms there will be challenges on the mobility front but most of them should be met before the 52,000+ stadium is put into operation. This includes multi-modal rail, improved pedestrian access and bike-sharing infrastructure – all playing a role in encouraging people to leave their cars at home. AS Roma's vice-president took the front row when listening to Raggi's comments and is satisfied with the outcome. But for him today's decision is more of a publicity measure. “We're not surprised, we expected a positive outcome as the draft already described our traffic studies as professional. Problems were found but in a wider context, impacting the city and not the site for which we are responsible.” Mauro Baldissoni said. He stressed that the report has no legal bearing, it's just a recommendation and further argument in favour of the new stadium. Baldissoni reminded journalists that the club and public authorities continue to work on the development on a daily basis. AS Roma has been waiting for half a decade now since the 2014 design presentation. Work was initially hoped to begin in 2015, then 2016 and 2017. In the latter year a crucial agreement with mayor Raggi was reached, then the project was approved by all major entities in December, 2017. And yet groundbreaking didn't take place in 2018. Will 2019 change this? Let's hope so.